We’re noticing an increasing number of grantmakers who want to take the opportunity of moving to a new system to rethink their grantmaking process. This is a great idea, but it also raises a lot of questions. Whose needs should be prioritized? How many approvals is enough? How do we even define what it means to improve a grantmaking process? To begin to answer these questions, I looked to the for-profit sector which has been doing process improvement for decades - knowing that directly applying their frameworks may be misguided but that there likely would be insights we could glean and translate to a philanthropic context. This led me to “lean thinking” - a set of ideas and principles that can be used to guide and direct process improvement work. For some of you, hearing “lean” and “minimize waste” may sound like a thinly veiled reference to downsizing. This is an unfortunate result of some companies looking for quick cost savings in the name of lean, while ignoring underlying principles. 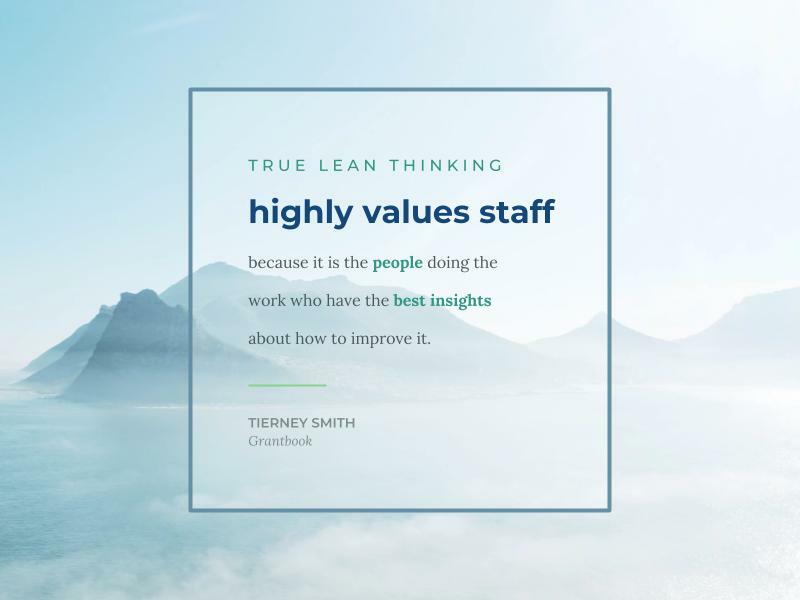 True lean thinking highly values staff because it is the people doing the work who have the best insights about how to improve it. You can’t create a culture of continuous process improvement if people think it might cost them their jobs. While it’s possible that some foundations could conclude that they are overstaffed for what they are trying to achieve, I anticipate that in most cases, staff will be able to shift their time to work that creates more value. 1. Who is the “consumer” that you exist to serve? In the case of philanthropy, this is an interesting question. Is the consumer the grantee, who creates the impact you’re trying to achieve? Is it the board, philanthropist, government or corporation who provides the funding and vision? Or is it the grantees’ beneficiaries, human or not, who benefit from the services provided? 2. How does your “consumer” define value? What is it they really want/need from you? In lean thinking, value is always defined from the consumer’s perspective. Philanthropy’s unique disconnect around the consumer - people who receive a product/service aren’t the same ones paying for it - only makes it that much more important to be clear on value. Lean thinking then defines "waste" as every part of the process that does not create value. Some waste cannot be avoided (such as compliance checks required by law), whereas other waste (such as time where something is sitting around not being worked on, any re-work to fix issues, etc) should be minimized or eliminated. Philanthropy’s unique disconnect around the consumer - people who receive a product/service aren’t the same ones paying for it - only makes it that much more important to be clear on value. 3. How can you realign your process, tools and organization structure to create more value and cut back on waste? Lean thinking offers many principles and techniques on how to do this, some of which will apply to philanthropy and some which won’t. It’s a big topic, so I hope to explore some of the more relevant pieces in future posts. My hope is that applying lean thinking in philanthropy will not only help foundations streamline their work, but also to make it more grantee-centric. Regardless of who you consider to be your primary “consumer,” it quickly becomes clear that grantees are central to creating value. So, I would argue that every foundation’s processes should put grantee’s needs front and centre - something that we as a sector could improve on. What creates value for your grantees? Likely the honest answer is the funding you give them - preferably reliable, substantial and unrestricted. It’s possible you also add value to grantees in other ways, for example through capacity building opportunities, connections, visibility and generative conversations. that the complex compliance process we have in place is something we need versus something that evolved, and may no longer be serving us. Fortunately, lean thinking is all about continuous improvement. Start with small experiments: try something new or a bit different, see what the result is, and keep, ditch or tweak it depending on what you find. Over time, sharing successful results will create interest and build momentum. What approaches and frameworks have you found helpful in process redesign? If this post has piqued your interest, let’s talk! I am a translator between the languages of technology and social change. It's a good day when I can not only help a client to make a good decision, but to see it through in a way that everyone can get on board with. 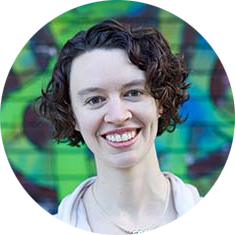 My background includes nonprofit tech at TechSoup Canada, and software engineering at the University of Waterloo.